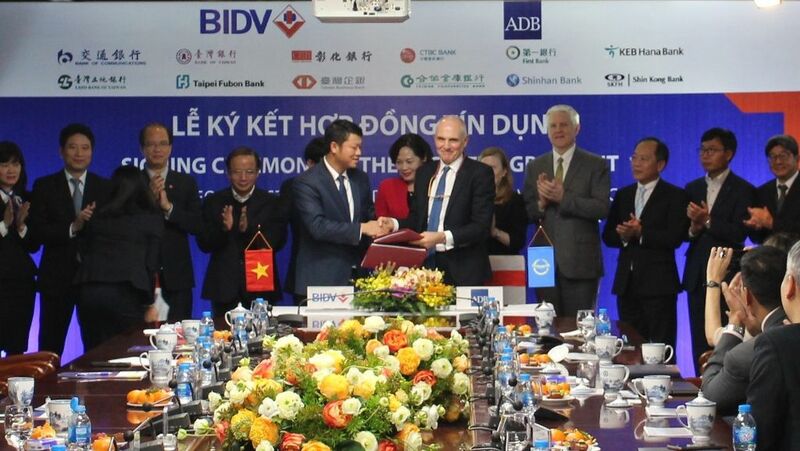 HA NOI, VIET NAM (12 December 2018) — The Asian Development Bank (ADB) and Joint Stock Commercial Bank for Investment and Development of Vietnam (BIDV), the country’s largest commercial bank by assets, today signed a $300 million loan agreement to support the growth and productivity of small and medium-sized enterprises (SMEs) in Viet Nam. The facility is comprised of a senior unsecured A loan of $200 million provided by ADB and a B loan of $100 million provided by 12 commercial lenders and divided into a three-year tranche and a five-year tranche. The agreement was signed by Director General of ADB’s Private Sector Operations Department Mr. Michael Barrow and BIDV’s Senior Executive Vice President in charge of the Board of Management Mr. Le Ngoc Lam at a ceremony in Ha Noi. SMEs account for most of Viet Nam’s businesses, contributing around half of total employment and 40% of gross domestic product. Despite their significant contribution to the economy, SMEs still encounter numerous obstacles that inhibit their economic potential, including lack of access to finance needed to expand. In recent years, BIDV has increasingly served the SME segment with positive results. As of 30 June 2018, BIDV had 250,000 SME customers—almost 40% of total SME customers in Viet Nam. Its lending portfolio to SMEs reached over 240 trillion Viet Nam dong (VND) (approximately $10.4 billion), giving it the largest share of SME lending among the country’s banks. The loan will make ADB the first development finance institution to provide long-term lending to BIDV. ADB will work with BIDV to maximize the positive social and environmental impacts of the assistance by implementing an environmental and social management system. Digital finance will be promoted through the introduction of new digital products to reach financially underserved populations in rural areas including SMEs owned by women. The loan demonstrates ADB’s ability to catalyze long-term lending from commercial institutions to channel investments for development impact, said Mr. Barrow. Twelve commercial lenders from the Republic of Korea, the People’s Republic of China, and Taipei,China have joined with ADB to provide the long-term lending facility. Founded in 1957, BIDV is the largest commercial bank in Viet Nam by total assets. As of November 2018, the bank’s total assets reached over VND1.25 quadrillion (equivalent to $55 billion) with a network of over 1,000 branches and transaction offices in Viet Nam and worldwide. For the three consecutive years since 2016, BIDV has been the only bank in Viet Nam to be honored with the award of “ADB’s Leading Partner Bank in Viet Nam”. It has also been awarded “Best SME Bank Viet Nam 2018” by Global Banking and Finance Review (UK), “SME Bank of the Year” by Asian Banking & Finance (Singapore), and “Best SME Bank Viet Nam 2018” by Alpha Southeast Asia.